There is no doubt that the greater Baltimore area has a wide range of housing types. Our architecturally diverse neighborhoods present many home maintenance challenges. Often, only trenchless pipe repair can solve the complex underground plumbing problems that we come across. Whether it is a sewer line running through a narrow yard of a townhome in Charles Village, or a water line stretching below a perfect patio in Ruxton, sometimes minimally invasive – or “no dig” – pipe repair methods are necessary. C.A. 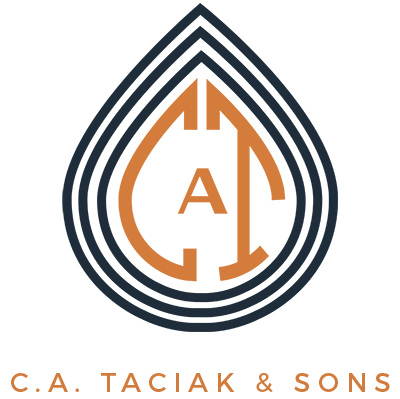 Taciak & Sons is proud to offer our clients a broad spectrum of plumbing solutions. We tailor each job to the individual needs of the homeowner. That is why, in many cases, our neighbors require trenchless pipe repair for their home’s plumbing project. Is your home experiencing any of the symptoms of sewer or water line problems? Are you concerned about the damage that may occur to your lawn or home during the repair process? We are confident that we can find a trenchless solution that will work for your home. Frank and Sam Taciak are happy to walk you through your options for trenchless repair or replacement of your water line or sewer. If you are ready to start the repair process, call us at (410) 960-2667. If you are curious to know more about the trenchless repair process, please take advantage of our guide below. What are Trenchless Sewer and Water Line Repairs? Trenchless sewer and trenchless water line repairs are minimally invasive pipe repair methods. Pipes in difficult positions can be effectively mended through trenchless repair. Sewers and water lines often run under driveways, patios, trees, and other obstacles. Trenchless pipe repair allows access to these lines without disturbing the structures above. It is particularly helpful when a combination of impediments are present. Multiple obstructions often hamper conventional pipe repair, making it no longer cost effective. The name “trenchless” pipe repair is actually a slight misnomer. 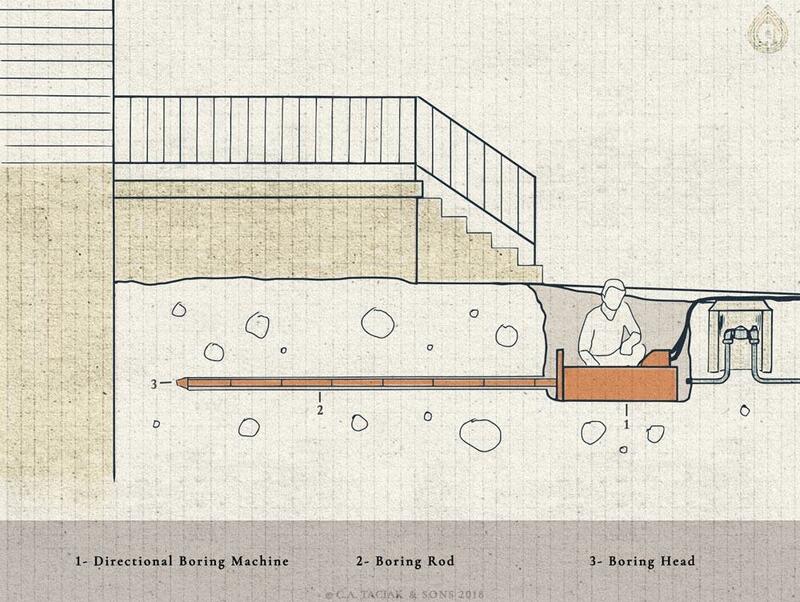 Most trenchless technologies still require a small amount of digging. The beauty though, is that the amount of excavating needed is minor. Done precisely and backfilled in a tidy fashion, it looks like the area was never dug up at all. Is My Project Right for Trenchless Repair? Minimally invasive sewer repairs come in many different forms. Choosing which variation of trenchless sewer repair to use depends on the nature of the project. There are four main varieties of trenchless sewer repair. Pipe patch – a small scale version of pipe lining – is a new and extremely effective trench-less repair method. It is essentially a stent used to seal up problems in the pipe. Similar to traditional pipe lining, an inflatable bladder wrapped in epoxy resin fabric is pushed to the damaged area of the original pipe. The bladder is inflated, creating a form for the the resin to harden within the host pipe. This creates a smooth new pipe within the old damaged pipe. It is perfect for sealing cracks and even bridging gaps of missing sections of pipe. Pipe Patching is typically used for spot repairs of sewer and drain lines, and is often extremely cost effective. You can research more about Pipe Patch on our pipe patching service page. Pipe bursting is a trenchless sewer line repair technique that pulls a new pipe through the path of the old pipe. During this process, the original damaged pipe bursts apart, and is replaced with a new problem free pipe. This is accomplished in the following manner. A high strength steel cable is first fed through the existing sewer line. The new pipe, along with a “bursting” head, is attached to one end of the cable. On the other end, a high powered hydraulic pulling device is set in place. The new pipe and bursting head are then pulled through the old pipe by the hydraulic pulling device. The force breaks apart – or bursts – the old pipe as it happens. Pipe bursting is extremely powerful and can breakthrough even old cast iron piping. Pipe bursting usually uses hyper durable HDPE piping. This pipe fuses together, thus eliminating problem areas around joints. Pipe coating is a trenchless sewer line repair technique that covers the problem areas of a pipe with new durable material. The inside of the damaged pipe is painted with a specialized durable epoxy resin. This resin seals problematic pipe joints, cracks, and defects. The resin inhibits root intrusion and any other issues that lend themselves to clogs. Pipe coating is truly a trenchless system. The specialized machinery required can operate through almost any available clean-out or equivalent and is truly a trenchless repair method. Pipe lining is a trenchless sewer line repair technique that installs a new pipe inside of the damaged one. An epoxy coated liner is installed in the existing pipe. The liner is then inflated. This liner first expands, cures, and then hardens. A smooth, damage free “pipe” then takes the place of the broken one. You may be asking “doesn’t this choke down the space inside of my sewer line?” Although the epoxy pipe liner is very durable, it is also very thin. The liner’s thickness is minimal and the room it occupies in your existing pipe is negligible. The benefits of the liner inhibiting root intrusion, cracks, and clog causing snags far outweigh the small size constriction it creates. Pipe lining is not always the best course of action. If there is any significant structural defects on the piping, the liner will conform to these issues. Sewer lining is advised for runs of pipe with less severe ailments. C.A. Taciak & Sons is proud to help our clients with each of these trenchless sewer line repair techniques. If your home is experiencing sewer problems, you may have concerns about the potential damage a project may cause to your property. 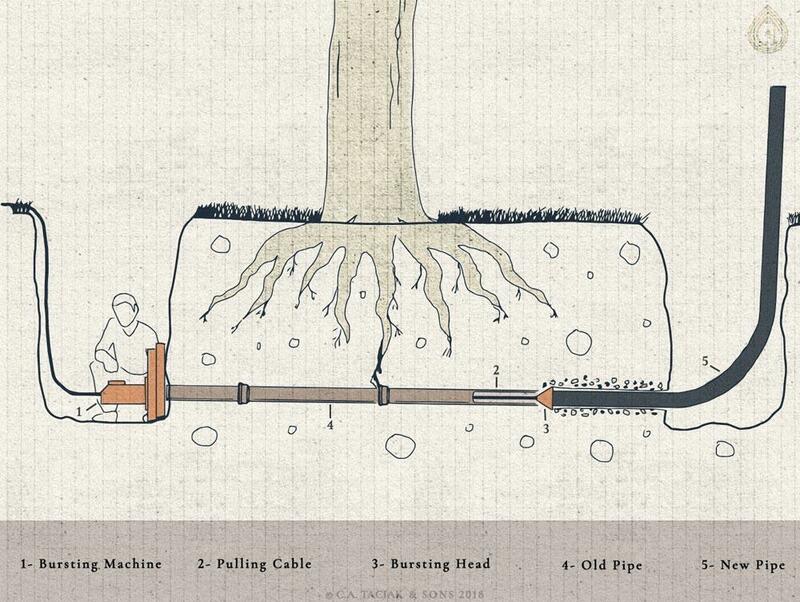 This is only natural, and we encourage you to get in touch with us about a trenchless solution. Trenchless repair is not a one size fits all technology. There are many options when it comes to minimally invasive water line repairs. Three of our favorite tried and true solutions are directional boring, pipe bursting, and pipe driving. Directional boring is a technique for trenchless water line replacement. Essentially it drills a path for new pipe installation. A special boring tool drills a hole from one point to another. In most cases, a hole is drilled from the water valve at the property edge to the basement utility area. After the path is dug, the boring head is taken off and replaced with a pulling attachment. The new water line pipe attaches to the pulling head. The directional boring rod pulls back, bringing the new pipe through the bored hole. Directional boring is generally only used for water line replacements, as a repair does not require tunneling. Often, obstructions like garages, driveways, sidewalks, patios, sheds, and landscaping are in the way. Directional boring allows for drilling under and around these structures. Pipe bursting is a trenchless water line repair technique that pulls a new water line into the place of the existing one. Pipe pulling for a water line repair is similar to that of a sewer line repair. A high strength steel cable gets pulled through the damaged water line. A new pipe is attached to one end of the cable along with a “bursting head.” A hydraulic pulling device hooks to the other end of the steel cable. The new pipe is then pulled through the old pipe, slicing apart the old pipe as it happens. Pipe driving is one of the oldest trenchless water line repair techniques. It is a simple but highly effective process. A hard piece of pipe is physically pushed underground beneath the obstacle. Pipe driving only works when the water line needs to go “trenchless” for a short distance. When a porch, driveway, or sidewalk are in the way of a water line repair, pipe driving is a great option. We prefer to give our homeowners several options. C.A. Taciak & Sons is proud to offer each of these trenchless water line techniques to our clients. If your home needs a water line replacement, you may have concerns about the potential for disturbance to your property. Please contact us for a consultation on trenchless water line solutions for your home. Are There Any Downsides to Trenchless Repair? There are virtually no downsides to trenchless sewer or water line repair or replacement. It is often the best solution for projects that require the bypassing of obstacles. Although it can be more expensive that traditional methods, the restoration costs saved often make trenchless solutions a great value. For these reasons, trenchless sewer and water line repair solutions are the pinnacle of underground plumbing repair. What is the cost of trenchless sewer and repairs? It may appear that trenchless sewer and water line repairs cost more than traditional pipe repair. At first glance that is true. The nature of trenchless technology requires the operation and maintenance of very specialized equipment. There is a high barrier of entry to be a trenchless contractor. This equipment is expensive to purchase and requires extensive knowledge to operate effectively. However, trenchless pipe repair is extremely cost effective when you weigh all of the factors present. Does your home’s sewer or water line repair project require that work be done under an existing structure? It will absolutely be less of a financial burden to use trenchless repair in this situation. Directionally boring your water line under your driveway will be less expensive than paying for the replacement PLUS a new driveway. Pipe lining your sewer under your garage will cost less than a repair AND a new garage floor. As with most major home repairs, you should seek to be educated on the problem at hand and determine the best solution for your family. C.A. Taciak & Sons is happy to be a plumbing consultant to the greater Baltimore area. Call us to schedule your water line or sewer project consultation. We would be happy to help determine if trenchless repair can be beneficial to you.